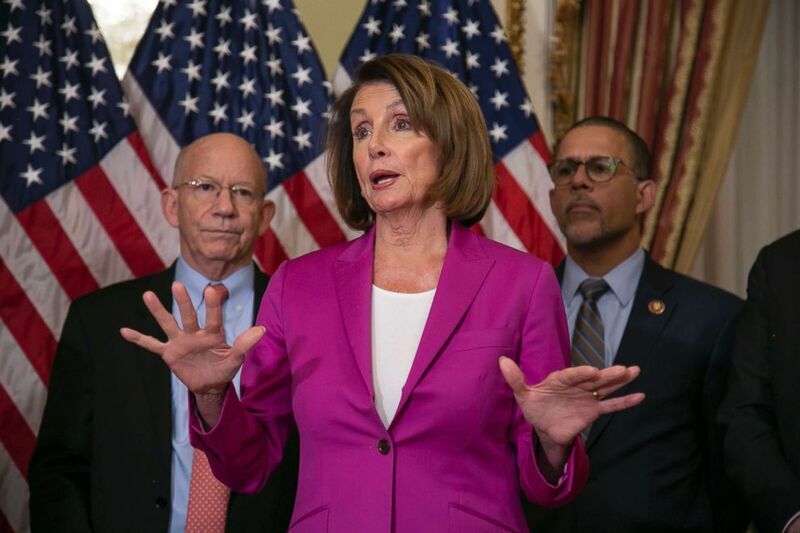 House Speaker Nancy Pelosi on Friday accused President Donald Trump and his administration of endangering the lives of Americans, including her own, by publicly revealing a congressional delegation’s plans to travel by commercial aircraft to Afghanistan. Pelosi had tried to salvage aspects of a congressional delegation to Afghanistan blocked by Trump, but was unable to continue the trip on commercial aircraft due to “increased" danger to officials on the trip, her spokesman said Friday. In what was becoming an increasingly personal feud in their political standoff over Trump's demand that congressional Democrats agree to pay for his proposed border wall, the president on Thursday torpedoed plans at the last minute for the delegation to utilize a military aircraft to make the trip, citing the government shutdown as the reason. The day before, Pelosi had called for a delay in Trump's State of the Union address, scheduled for Jan. 29, until after the government shutdown ends. White House press secretary Sarah Sanders made Trump's letter to Pelosi public in a tweet. Asked if she believes the move was in retaliation of her letter to Trump asking the president to schedule a new date for the State of the Union after the shutdown ends, Pelosi laid on thick sarcasm. Speaker of the House Nancy Pelosi talks to reporters after signing a bill requiring that government workers receive retroactive pay after shutdown ends, at the U.S. Capitol, Jan. 11, 2019. Overnight, before the rescheduled commercial flight, the State Department’s Diplomatic Security Service provided an updated threat assessment, “detailing that the President announcing this sensitive travel had significantly increased the danger to the delegation and to the troops, security, and other officials supporting the trip,” according to a statement from Pelosi spokesman Drew Hammill. A U.S. official familiar with the trip's logistics told ABC News that security planners voiced concerns about the idea of the speaker and her delegation flying to Afghanistan outside of typical military-travel arrangements. Hammill said that the White House also leaked plans for the delegation to continue on commercial travel. A senior Pelosi aide pointed to “multiple administration” sources telling reporters Friday morning that the delegation would continue on commercial aircraft. ABC News was among those contacted. The White House denied that the administration leaked word of the commercial travel plans. "When the Speaker of the House and about 20 others from Capitol Hill decide to book their own commercial flights to Afghanistan, the world is going to find out," an administration official who refused to go on the record told ABC News. "The idea we would leak anything that would put the safety and security of any American at risk is a flat out lie." 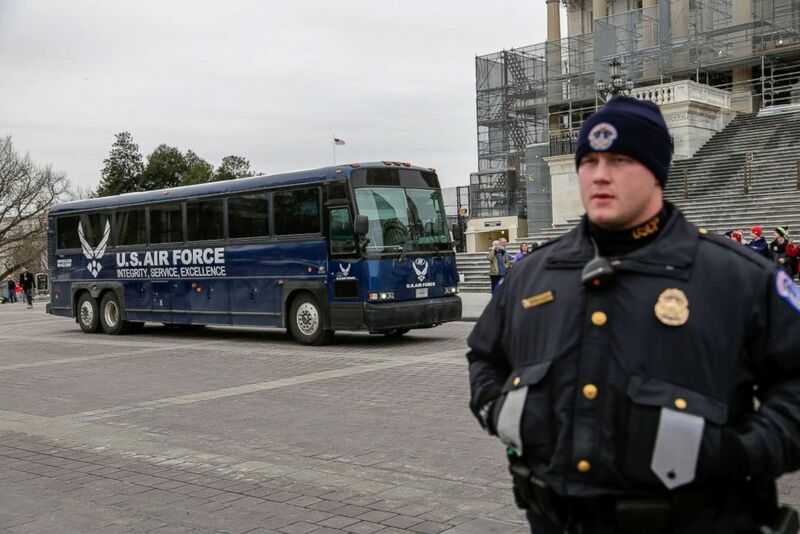 An Air Force bus parked on the plaza of the Capitol for the congressional delegation that had planned a trip to Afghanistan, Jan. 17, 2019, in Washington. Pelosi was still in her office in the U.S. Capitol when she received a letter from the president Thursday afternoon, where Trump announced he was postponing the excursion due to the shutdown. Trump suggested Pelosi fly commercially if she wished to continue her travel. The delegation had loaded onto a bus operated by the U.S. Air Force for the drive out to Joint Base Andrews. Instead, the bus drove lawmakers to the East Plaza of the Capitol, where members disembarked from the bus and walked into Pelosi's office. After huddling with Pelosi for hours behind closed doors, Reps. Adam Schiff, Eliot Engel, Stephen Lynch and Mark Takano -- who all had planned to join the trip - quietly left the Capitol, declining to comment as they rolled suitcases through the basement of the Capitol. Reps. Susan Davis and Elaina Luria were also members of the delegation. 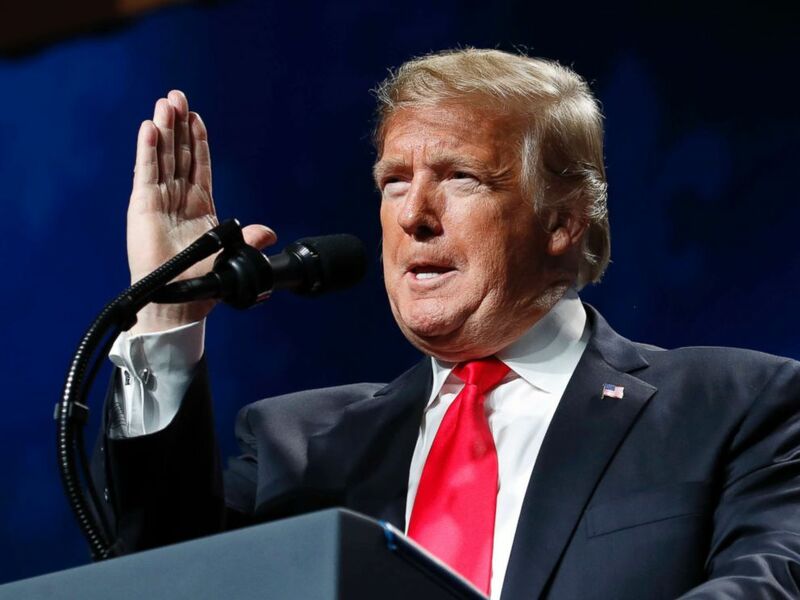 President Donald Trump appears at the American Farm Bureau Federation's 100th Annual Convention, Jan. 14, 2019, in New Orleans. Friday morning, Trump continued to criticize Pelosi for scheduling the trip during the shutdown. A letter from the acting head of the Office of Management and Budget. Later Friday morning, the White House released a memo from the Acting Director of the Office of Management and Budget, Russell Vought, to the "heads of all executive Departments and agencies, blocking any congressional delegation from using military aircraft. "In light of the current partial government shutdown, the President has asked me to direct the heads of all executive departments and agencies of the Administration on new policies in support of Legislative Branch travel," the memo reads. 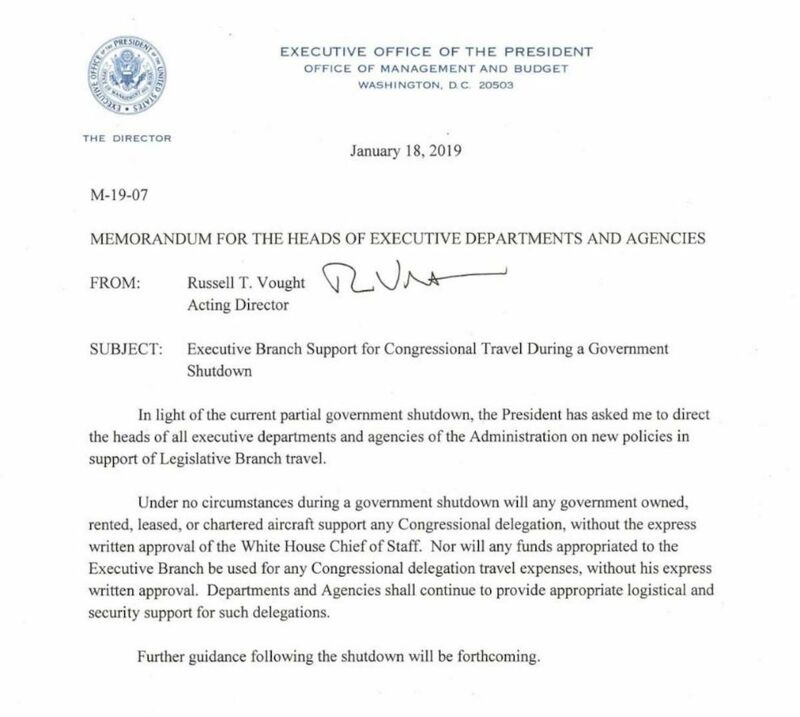 "Under no circumstances during a government shutdown will any government owned, rented, leased, or chartered aircraft support any Congressional delegation, without the express written approval of the White House Chief of Staff." The partial government shutdown is now in its 28th day. The House of Representatives returns to session next Tuesday, likely ensuring the shutdown will continue through the long Martin Luther King Jr. Day holiday weekend.